The Sundowners were one of the first Birmingham groups to make a successful transition from rock ‘n’ roll to a blues/R&B-based format and this was at a time when most other groups were copying the new “Mersey Sound”. They were originally formed in the late 1950’s in the wake of the American rock ‘n’ roll invasion which saw the formation of many early British groups during the pre-Beatles era. The early line-up of the Sundowners changed frequently and by about 1960 consisted of electrician’s apprentice Mick Adkins (lead guitar), Dennis ? (rhythm guitar), Joe Parsons (bass guitar), drummer Kenny Bland, and vocalists Jimmy Rhodes and Ron Parsons. Material performed by the group at this time was mostly rock ‘n’ roll standards along with lots of Everly Brothers covers. 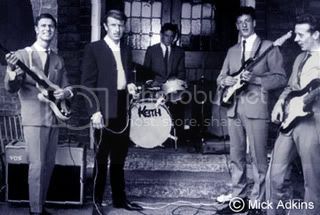 Guitarist Dennis was forced to leave the group because of poor health and was replaced by Keith Warrender, while drummer Kenny Bland left and was eventually replaced by Keith Harrison. A regular booking for The Sundowners was at the Atlas Ballroom in Stechford Birmingham as well as the Shirley Annex youth club in Solihull where a lot of well known local groups played including Mike Sheridan and The Nightriders and Denny Laine and The Diplomats amongst others. The Sundowners were also one of the many West Midlands groups to go on the Regan’s dance hall circuit and this included spots at the Adelphi in West Bromwich as well as the Ritz in Kings Heath. Towards the end of 1963, lead singer Jimmy Rhodes left after getting married which meant that the group were now limited in the material that they could perform due to the lack of a strong vocalist. Ron Parsons also decided to leave and this situation prompted the Sundowners to try their hand at backing an established vocalist and so they became Robbie Hood’s “Merry Men”, Robbie being local performer Mike West who was one of pop manager’s Reg Calverts resident acts. Reg Calvert was a well known manager and booking agent in the 1960’s and his stable of acts would also include Brummie group The Fortunes amongst many others. Robbie Hood’s stage show involved the gimmick of appearing on stage dressed as the famous outlaw “Robin Hood” which included not only a hat but a full costume of Lincoln green consisting of tunic, boots, and tights. Unfortunately for the Sundowners, they also had to dress up in the appropriate costume including the “tights” which did not go down well with the group although they were eventually persuaded by Robbie who promised them lots of bookings and a record contract. While the “record contract” did not materialize, Robbie Hood and his Merry Men certainly had plenty of bookings and they played up and down the country for the next six months. Although Reg Calvert was able to get them booked into some of the larger halls, the former Sundowners often found themselves cringing with embarrassment as they performed rock ‘n’ roll numbers while dressed in their Merry Men outfits and things came to a head when the group was booked to headline at a trendy club in London. The London audience was not receptive to the provincial charms of Robbie Hood and his Merry Men and they were literally booed off the stage after being completely upstaged by one of the hot local blues acts. This painful episode prompted the Sundowners to immediately resign their position as Robbie Hood’s Merry Men. Possibly because of the “Robbie Hood” experience, The Sundowners decided that a change of image was necessary and so they became a “blues” group as this style of music was becoming increasingly popular with the younger audiences and particularly university students. The transition to playing blues music was an easy one for the group, but lack of a good lead vocalist led the Sundowners to hire John Williams as the new front-man. Along with the new style, a new name was also decided upon so The Sundowners became The Chads. It was this group that would eventually include a young guitarist by the name of Jeff Lynne (see The Chads). To see much more information on the Sundowners and The Chads, visit Mick Adkins’ informative website at www.mickadkins.co.uk which features music files as well as some great pictures and stories. and to Mick Adkins for assistance in writing this feature. Just like to point out that I did not leave the band The Sundowners, I became very ill with pneumonia and while I was convalescing Mick Adkins replaced me with Keith! I only found out when I walked INTO THE REHEARSAL ROOM. I would like to add that shortly after that a man who introduced himself as Spencer Davis asked me to play drums for a new blues band called Jugs,o,Henry, I accepted and spent some time with them playing popular Blues clubs around Birmingham, eventually we landed up in London which I didn’t like so I headed home. I recently tried to find any mention of Jugs O Henry later to become The Spencer Davis Group but without any sucsess be nice if you cold find out anything.PS, in the time I was with them Mr Davis never paid me a penny! !